I haven’t seen many companies who effectively us e SMS marketing to engage their potential or existing customers. I’m not saying they’re not out there, I’m just not their target audience and treat all unsolicited text messages as spam. So it was a pleasure when I ran into a restaurant who did a great job of using SMS to facilitate my dining experience and provide an opportunity for continued engagement. I was told by a fellow tourist to check out the food at the Crab Shack while visiting Savannah, GA. I love a good crab boil so it was a no brainer. When I arrived at the restaurant I was told there was a 10-min wait by the host. I was asked for my phone number and permission to text me when my table was ready. I thought it was an interesting alternative to giving me a pager, so I was happy to have them text me. When my table was ready, they texted me to return back to the host – so far, interesting but no big deal. My favorite part was when I left. Before I could step out the door they sent me a third text thanking me for the visit and provided me with a way to get on their VIP list for discounts and updates. Wow, a timely text that made me feel appreciated and provided me with a channel to become a loyal customer. If I visited Savannah often enough I would have taken advantage of their program. Reimagine your customer experience and think of new ways to engage your audience. I like the idea of replacing the restaurant pagers with my cellphone since it’s one less thing to carry around. There are lots of customer touch points that we might be able to change using new technologies or processes. Engage in a timely manner. What made this a great experience was the text I received as I was leaving the restaurant to thank me for dining there and offering me discounts in the future. It would not have been as effective if they texted me the next day. Look for ways to engage in complementary channels. My guess would be their VIP program was SMS based as well, but it would be great if they executed it through email or social channels. You don’t need to stick with the channel you first made contact with your customer. Don’t treat your marketing channels as a silo – integrate them so they work in synergy. Be authentic. The one downer of this experience was that the host told me the wait was 10-mins and they texted me one minute later telling me my table was ready. I got the feeling they artificially raised the wait time just to get my phone number. I’m fine if you’re faster than the time you quote me but please be in the ballpark. Monitor the social channels. I love to tweet or update my Facebook with photos of food I love. What if I tweeted a photo of my meal and they acknowledged it while I’m still eating? What if they gave me a desert or free soft drink just for checking in on FourSquare? Don’t advertise it, make it a surprise to delight. I don’t know, maybe too creepy? But if done well I think it would work. Provide excellent customer service. For me, this only works well when all of the other parts of your business are in great shape. If the food is not top notch or the staff is not friendly, all of the marketing technology will not help, and with the empowered customer it can do more harm. SMS marketing will only work with a certain percentage of your audience. Not all of them will have SMS-ready phones and many wont give you their phone number for many reasons. So look for great alternatives or do the usual processes very well. It’s important to know your customer – understand if this is something that they would appreciate and enhance doing business with you. Try it out and get feedback as you roll out the program. 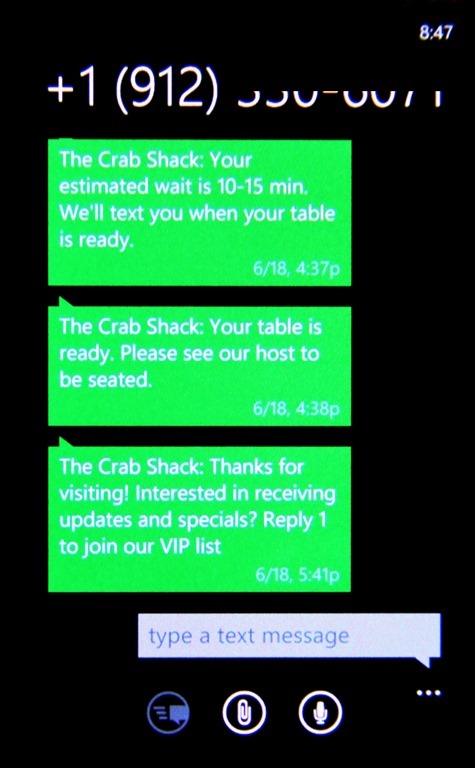 Have you seen any other great examples of companies who have effectively used SMS to improve their customer experience? Disruptive digital, social & content marketer with a passion for customer experience. Formerly with Microsoft. This entry was posted in Customer Centricity, Customer Satisfaction, Digital Marketing, SMS Marketing and tagged Customer Satisfaction, SMS Marketing. Bookmark the permalink. I just came onto your post and found it quite interesting. I am also associated with SMS Marketing, SMS text Marketing ,text Marketing, text Messages marketing, and enjoy to read the stuff on the same as its rarely found on internet. Thanks again for writing such a good post. This information is great. I hope to find more useful blog posts here that will expand my knowledge. Thanks a lot for putting this up. The story is interesting. SMS are valuable only if sent on time. So Far in my life I never encountered any company who left me with a great SMS experience.